The first day of Taiwan's Computex hasn't been dominated by any product release – far from it. It's the obvious indictment by the computing industry that it loves Windows 7, hates Vista, and wants Microsoft to put its marketing programs in place today. Microsoft's keynote is to follow so maybe the 'big announcement' is just that. Not until now had Microsoft so clearly given up on Vista. On the walls of its own booth there's not a mention of Vista in sight. The new saviour of Microsoft is waiting. Some product demos of gaming desktops and performance notebooks across the Microsoft booth begged the question as to where the current operating system actually was. The reaction of almost shock and bemusement - complete with responses like 'what's the point' and 'it's all about Windows 7 now' - confirm Microsoft's final admission that Vista is finally ready to die. But what does this mean for computer manufacturers selling desktops and notebooks today? How are they expected to sell their computers now? Across pretty much every booth, we searched for a Vista installed machine…we found none. Acer for one is now very firmly focussed on Windows 7-only machines. Its new range of touchscreen all-in-one PCs were pre-installed with Release Candidate build 7010 of Windows 7. 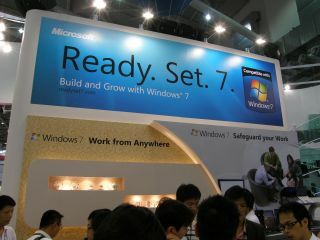 We were even advised that Acer would let us fully review the product with the beta release of Windows 7 installed. This was blatantly regardless of the fact the product wasn't slated for release until October 23rd – the date Acer very kindly informed us all a month earlier as the release date of Windows 7. Incidentally, the talk in media circles is that this slippage of release date info was no accident – it was a strategic decision by Acer to hold Microsoft to this release date since Acer (as well as all the other PC manufacturers) just cannot stomach Vista on their systems for any longer.